April 28, 2014 An Egyptian court has recommended the death sentence for the leader of the now-banned Muslim Brotherhood and 682 supporters, state television said on Monday. Mohammed Badie, the Brotherhood’s general guide, is among 683 supporters of ousted President Mohamed Morsy whose death sentences are not final — as the case has been referred to the nation’s Grand Mufti, Egypt’s highest religious authority, for review. In the second case relating to 529 Muslim Brotherhood supporters sentenced to death last month, the judge upheld 37 death sentences. The rest saw their sentences commuted to life in prison. Most of the people sentenced are being tried in absentia. All defendants are still permitted to appeal. 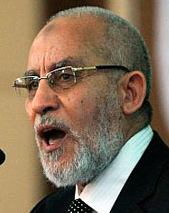 In August 2013, we reported on the arrest of Dr. Badie and in July 2010, we reported on the election of Dr. Badie as the new Supreme Guide of the Egyptian Muslim Brotherhood.